Late last night/very early this morning, we started seeing reports that some Samsung Galaxy Nexus users were getting the Android 4.2 Jelly Bean update, and now it looks as though that rollout has been extended to the Nexus 7. As with the Galaxy Nexus update, you can just check the Settings>About Tablet>Software Update tab and see if you're one of the lucky ones to be given access to the new software, or you can update manually. Be warned though, updating manually does have some pretty strict requirements right now. Unless you are rooted and running ClockworkMod Recovery, you'll have to manually push the update via ADB, meaning you have to have the Android SDK installed, you have to be comfortable in the command line, and you cannot have any of the 4.2 apps flashed on your device already. That last one is key. If you've flashed the new keyboard, camera app, or anything else, you'll have to flash back to stock Android 4.1.2 build JZO54K before proceeding, because the install will fail. Reboot your Nexus 7, holding both the Volume Up and Volume Down buttons while it boots up. When you get to the fastboot menu (it says "Start") press Volume Up until it reads "Recovery" then press the power button. The device will switch to Recovery mode, and when you see an Android with a red exclamation point icon, press Volume Up and the Power buttons together, which will bring up the Recovery menu. Select "apply update from adb." 2) Make sure you have adb (if you don't, download the Android SDK and install the updates). Connect your Nexus 7 to your computer with a USB cable. 4) You should see a progress bar, which will eventually hit 100%. At this point, your device is installing the update. 5) Reboot and you're now running Android 4.2, so start playing with the new stuff like lockscreen widgets! Yeahhhh !!! baby !!! 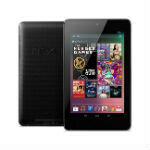 grabbing my new Nexus 7 now !!! i LOVE Google !! Already have this on S3. loving it. http://forum.xda-developers.com/showthread.php?t=1989158 That link is even better as it is full 4.2 and you can flash it without restrictions, at least on my NEXUS 7 - in options do no MD5 check and ver check. this update, will this work too in samsung grand duos gt-i9082 and galaxy tab3 sm-t210? please i need to know before i start in mine.